Households are facing record energy price hikes and rising electricity bills, adding to already unaffordable cost of living pressures. From July 1, the energy companies that have a 90% share of the NSW market have increased electricity prices by up to 17% collectively (on top of an 8% increase last year). Annual average increases of $320 for households and $920 for small businesses are expected, with many paying much more. NSW also has a standard kilowatt per hour price more than double that of other countries such as Great Britain, Sweden, Greece and Germany­. More than a million NSW households are paying more for their electricity than any other developed nation. The NSW Liberal Government is responsible for the current state of the electricity market. For six years the NSW Government has had one energy policy – privatise everything. They sold the generators and they deregulated electricity prices. Now, worst of all, the Berejiklian Government does everything it can to drive up electricity prices, including using taxpayer money to take legal action at every turn to block the Australian Energy Regulator’s determination to lower bills. 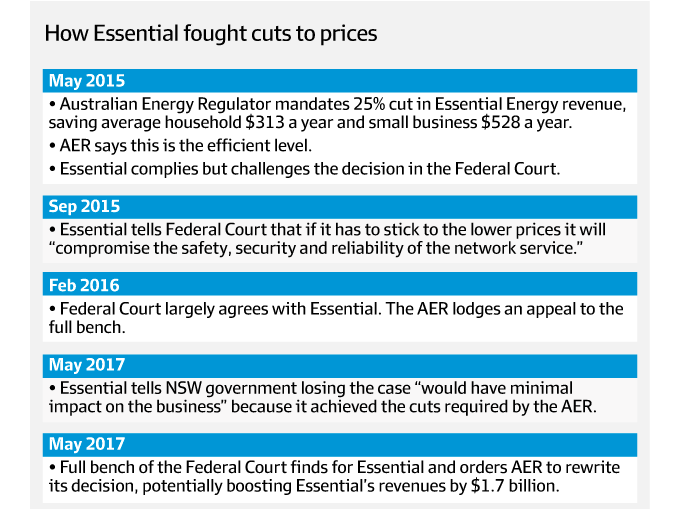 In that legal action, state government-owned electricity provider, Essential Energy has now been caught out lying over its reasons for fighting price cuts for household and small businesses in regional NSW. It claimed there would be catastrophic consequences if price cuts went through, but a May 2017 confidential briefing document prepared by Essential admitted that if it lost the case against the Regulator the “impact of this outcome on the business today would be minimal”. This means that customers across regional NSW face paying hundreds of dollars more for electricity, while Essential Energy uses that extra cash it takes from customers as pure super-profits. NSW Labor is calling for an inquiry into Essential Energy’s behaviour. In her first budget, Premier Gladys Berejiklian also cut State Government assistance to households struggling to pay soaring energy costs by an average of nearly $50 or nearly 14% per eligible household, per year. The result is an electricity supply that is unaffordable for many families. Nearly 70,000 homes across Sydney are in danger of having their lights turned off and power disconnected, because they cannot afford their skyrocketing electricity bills. Research from the NSW Council of Social Service (NCOSS) shows the situation has become so dire that 77% of low-income NSW households are going without heating in a bid to reduce their onerous power bills. One in three low-income earners have been forced to stop using hot water for bathing to pay for energy bills. Labor will not stand by and let family budgets be crushed and businesses wrecked by power price hikes. – ensure consumers are treated fairly and stop price gouging by the big energy companies. Labor also recognises the immediate need for more energy generation that can reliably contribute towards meeting demand, to avoid a repeat of the widespread blackouts and major power outages earlier this year in NSW. The Australian Energy Market Operator has made a stark and urgent warning about the risk of electricity supply falling short of demand, especially in extremely hot conditions. Labor is the only party in this state with the political will to capitalise on these areas of growth potential and outline a plan for secure and clean energy to avoid such blackouts happening again.